Your plumbing system is made up of many different pipes, fittings and fixtures. Some of the most important of these are taps, as they let you access your water supply. If this function is inhibited, say, because one of your taps has started leaking or has become difficult to turn, it can have a huge impact. If this has happened to you, don’t let the situation get worse than it already is. When you have a leaking tap, it isn’t just the damage to the tap that’s a major concern. The amount of water dripping from a tap can quickly add up. Which not only means a lot of water being wasted, but also a lot of money. There may also be some water damage to your cupboards, walls and flooring, which also needs to be fixed. At Metropolitan Plumbing, our fully qualified, licensed tap experts are able to repair or replace your taps. Regardless of what the specific problem is or what type of taps you’ve got. Our professionals are available 24/7, including public holidays and once have contacted us, there can be someone to your door within the hour*. One of my taps is leaking. What are you able to do with it? Depending on how serious it is, your attending plumber will need to either repair or replace the leaking taps. These are jobs in which we have all the skills, experience, tools and spare parts to do it for you quickly, efficiently and effectively. Having a leaking tap can be one of the most irritating experiences. Trying to sleep while listening to that constant drip, drip, drip soon becomes a frustration that’s too hard to handle. A leaking tap may not seem like a big deal, but in actual fact it is a huge water waster and can dramatically impact upon the cost of your water bills. Even more so if it is a hot tap that is constantly dripping. A leaking tap can potentially waste over 20,000 litres of water per year. With water restrictions constantly in place and household bills continually rising, don’t let your leaking tap contribute to the issues. Call in a tap plumber from Metropolitan Plumbing any time of the day or night on 1300 367 333. A worn out, or incorrectly installed washer is the most common cause of a leaking or dripping tap. But other reasons may include a loose O-ring, worn seals, corrosion of the valve seat, loose parts or broken pipes, the age of your tapware or if your water pressure is too high. When you contact Metropolitan Plumbing we will have a plumber to your door on the same day to inspect your leaking tap and correctly identify the cause. You can trust that a complete tap service will be provided. Meaning your plumber will install a new quality washer, replace and lubricate the O-rings and re-seat and re-grease the spindle threads to ensure that your taps are running perfectly once again. Many people can perform a DIY tap washer replacement, but doing so may only stop the problem for the short term. This is why we recommend a tap service to give you that extra peace of mind and provide a long term solution. If your tapware is beyond repair (due to damage or extreme age) your attending plumbing will have a range of new and modern tapware for you to choose from which they will be able to install quickly and easily for you. A new tap installation can also provide a whole new look for your bathroom, kitchen or laundry. so you can trust that we will have the tapware that you want; but you are also more than welcome to purchase your new tapware from elsewhere and we will be more than happy to install this for you. If you require a leaking tap repair – don’t leave it until you see the increase in your water bill. Have your leaking tap repaired upon the first initial drip by an expert from Metropolitan Plumbing. If you need a leaking tap repaired or need new taps installed, it is best for this to be completed by a trained plumbing professional. With so many different pieces, parts and connections, it can be confusing trying to install or repair tapware yourself. Enlist the services of a qualified plumber from Metropolitan Plumbing and we can have your new taps installed or old taps replaced or repaired with minimal downtime. Whether we’ve assessed your existing tapware and concluded that a replacement is best, or you’ve simply decided you want a new set of taps, we’ll be able to source and install the tapware for you. We have the expertise, experience and equipment to be able to install any type, make or model of tap set. 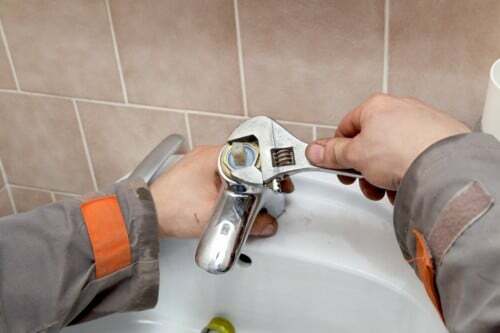 Our tapware professionals are able to carry out any work needed to fix your taps, including a full replacement if your malfunctioning tap can not be repaired. We can also organise a replacement if you want to switch to a different kind of tap, such as a mixer tap. Our plumbing professionals have a wide range of tapware for you to choose from, or we can install any tapware that you have purchased yourself. Your attending taps expert will be able to walk you through your options to help you decide on which type, brand and model of tap is right for you and will then organise a purchase. Once that’s been done, they’ll retrieve your new tapware and come straight back to install it for you on the same day. Here at Metropolitan Plumbing, we believe in giving our valued customers only the very best service for all replacements or installations. What kinds of tapware can you work with? Not all taps are the same. Taps in your bathroom are different from the taps in your kitchen, which are different from your taps in the laundry and so on. Here at Metropolitan Plumbing, we understand this fully well. Our experts have worked with all different taps in business and homes. If you have a leaking kitchen mixer tap, a difficult to turn shower tap or a problem with any other tap, we’ll be able to have the right person out to you who will have the very best solution for your situation. Taps which come through the wall, such as bath taps and shower taps are more difficult than the standard tap setup to fix. Since the breaching piece ( the T shaped pipe that supplies the tap with water) is concealed behind the wall, tiles and wall sheets need to be removed so the tap can be accessed. This is definitely a job for a fully qualified taps expert from Metropolitan Plumbing. We have experience with all types and brands of wall mounted taps, and can do any job needed to get them working perfectly again. You will need to contact a tiler or other tradesperson to repair the wall. Unlike the traditional system of two taps and a separate spout, the modern mixer tap setup uses only a single lever that’s most often connected to the spout. This lever can be turned to hot and cold, and can also mix the two to create any temperature you want. Mixer taps don’t have washers, but instead have a far more complex cartridge insert that controls the flow of water. Our plumbers are able to fix your problematic mixer taps for you, regardless of what type or brand they are. If a replacement cartridge can be sourced, we’ll be able to repair your existing tapware. If it can’t, or the tap is too far gone, we’ll be able to replace it with a brand new one. When you have a leaking or difficult to turn off basin tap or kitchen sink tap, you need to contact Metropolitan Plumbing straight away. Not only is a leaking tap annoying, but it can also cause damage to your surrounding cupboards or vanity unit. Depending on whether it is the washer, the T piece inside the sink or basin or the spindle or the valve seating, we will be able to repair or replace your basin tap or kitchen sink tap in no time. Either way, you can rest assured you’re getting the best service around from our extensively trained taps professionals. Regardless of whether you have a mixer tap, a wall mounted tap or a standard hob tap, Metropolitan Plumbing will be able to carry out any work you need to get your laundry taps working perfectly again. If your laundry taps aren’t too damaged, we will be able to repair them by replacing washers, cleaning the spindles, replacing the cartridge in mixer taps, and completing a full service. However, any taps that are too old, rusted or damaged will need to be replaced, which we can also do. Our tap experts have easy access to a full range of popular laundry taps in all types and brands, so we can install whatever you want. Shower taps, like many other types of tapware, can be either mixer taps or the traditional two tap setup. However, it doesn’t really matter what kind of shower taps you have, because all of our Metropolitan Plumbing taps professionals are fully trained and experienced in working with them both. We will be able to quickly and easily repair or replace your problematic shower taps, depending on what is wrong with them and how old they are. Contact us now and we will be able to have one of our taps experts around to you in no time to fix that leaking or difficult to turn shower tap. If your garden tap is leaking or difficult to turn, you need a full qualified, licensed tap expert from Metropolitan Plumbing to help you out. Garden taps generally fail because they aren’t used often, so the washer, spindle and other parts have time to rust and decay. If this is the case, we may need to replace your garden tap rather than repair it, but we can most certainly carry out a repair if the situation calls. All of our tap specialists have a huge range of spare parts in their vans at all times and can access all of the most popular brands of full tapware. In addition to the taps themselves, our professionals are able to repair or replace your shower roses, as well as spouts for all areas in the home and business. As part of their permanent van stock, our extensively trained taps experts carry a standard type of basin, sink, shower and bath spouts, and a standard type of shower head, so any replacement can be done quickly. However, we can also source any spout or shower rose you’d prefer, so you don’t need to do anything except contact us. Designed for easy and efficient use, quarter turn taps and half turn taps are a little more difficult to repair than standard tapware. Like a mixer tap, a quarter or half turn tap doesn’t have a washer, instead functioning with its own special cartridge. In order to repair a quarter turn or half turn tap, the cartridge will usually need to be replaced in addition to going through the normal service, but these cartridges can sometimes be difficult to get. Fear not! Our Metropolitan Plumbing taps experts have you covered – as always! If we can source a new cartridge for your tap, we’ll be able to repair it for you. Otherwise, we can quickly and easily replace your quarter or half turn tap for best results. Water filters are becoming more popular these days as people realise they can get bottle quality water at home. If you’ve decided you want a water filter installed, contact Metropolitan Plumbing and we will be able to get the right person around to you. We have training and experience with installing most types of water filters and can also source our recommended model for you if you don’t know which one you want. Can you work with all the different brands of tapware? Everybody has their preferences when it comes to taps and this includes brands and models. Here at Metropolitan Plumbing, we most certainly understand this. So we have made sure that all of our fully qualified, licensed plumbers have the skills, experience, tools, spare parts and knowledge to work with all of the most popular brands across Australia. Call Metropolitan Plumbing now on 1300 367 333 or fill out an online booking form. We will have a plumber to you in no time to help you with those troublesome taps.